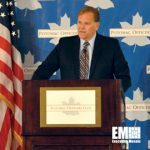 As covered in Executive Mosaic‘s weekly roundup on Thursday, Rep. Mike Rogers, chairman of the House Intelligence Committee, plays a pivotal role in U.S. efforts to protect the nation and its critical infrastructure from the gamut of cyber, human and other threats. The 12-year representative from Michigan has worked to align efforts on both sides of the aisle during his tenure and has helped pass legislation with bipartisan support in an often polarized political era. His importance in the lives of all Americans has continued to grow as recent developments and long-building situations have combined to intensify the spotlight and significance of the intersection of intelligence, cybersecurity and domestic and international relations. The Potomac Officers Club had the great honor of hosting Chairman Rogers today for a breakfast event that featured more than 150 government contracting executives from some of the leading firms in the federal government space. Through its traditional focus on engagement, the back-and-forth between Chairman Rogers and the assembled leaders from across the industry keyed on a variety of issues of great importance to the U.S. and world of today and the indefinite future. Casey Coleman, chief information officer for the General Services Administration, and Deputy Army CIO Michael Krieger are confirmed government leaders that will provide insight into efforts to support BYOD, enhancing the federal mobile workforce, improving processes and efficiencies through mobile solutions, among a host of other topics. Mike Janke, co-founder and CEO of global encrypted communications firm Silent Circle, will help represent thought leadership from the private sector on the same topics, and help drive the collaboration and engagement the POC delivers like no other organization. Click here to register for the Summit and we look forward to seeing you at this and many other great POC events to come.